One of the pleasing aspects of being a Celtic supporter of a certain vintage has been watching our fan base become more diverse. In the early days of the club the average Celtic supporter was a product of the Irish community which gave birth to the club in the first place. That is not to say that all supporters in the early days fitted that profile but most did. My grandad on my mother’s side came from what you might call an ‘Orange’ family but he loved Celtic and told me as a boy that they played the best football. He liked nothing more than watching McGrory, Scarff and Napier attacking the opposition even though his brothers ostracised him and on one occasion burned his Celtic scarf in the fire. It may appear strange to modern eyes that supporting a football club could lead to rifts in families but Celtic elicits strong emotions in some and some of the prejudice the club met in its early years lingers on yet. Today we see Celtic supporters coming from a variety of backgrounds which reflects the diverse nature of modern Scotland. Those of you who attend games regularly will have noticed the banners of the Polish Bhoys and the Polska Number 1 CSC at Celtic Park. Relations between Scotland and Poland stretch back over 500 years and one Polish study records that…. In more modern times one of the more epic journeys of the 20th century was that of the Poles who ended up in Scotland during World War 2. After the Nazi invasion of Poland in 1939, the UK and France declared war on Germany. The Poles fought gallantly but as the blitzkrieg cut deeply into their country things looked bleak. The final stab in the back came when Stalin sent the Red Army in from the east to brutally occupy eastern Poland. In order to pacify the newly annexed areas of Poland, the Soviets sent hundreds of thousands of Poles to the bleak gulags of Siberia where many perished in the dreadful conditions. In the spring of 1940, as Hitler launched his army against France, Stalin ordered the slaughter of more than 20,000 Polish army officers held prisoner in Russia. The Katyn Massacre is still commemorated in Poland today and remains one of the worst atrocities of World War 2. Things looked tough for Poland with the country annexed by two ruthless dictators. For the hundreds of thousands of Poles exiled in Russia the future was very uncertain but events in the summer of 1941 changed everything. Operation Barbarossa in June 1941 saw Hitler turn on the USSR with an invasion carried out by 3 million axis troops. Britain, who viewed the USSR as a despicable dictatorship now found itself an ally of Stalin. The Russians decided that the Poles in their country might as well go and fight the Nazis who were soon smashing their way towards Moscow. Many thousands of Polish men women and children under the command of General Anders began the long trek through Siberia, southern USSR and eventually through Syria to British controlled Palestine. The British happily enrolled the many thousands of former Polish soldiers into their own overstretched army and many of them were sent to Perthshire in Scotland for training. Polish soldiers and airmen contributed hugely to the defence of the UK in the darker days of the war. The famous 303 Fighter Squadron of the RAF was made up of Polish Pilots and shot down over 400 German planes in the war. In Scotland the thousands of Polish soldiers were trained and formed into the 1st Polish Armoured Division. Polish troops saw action in North Africa and in Italy where following a brutal battle the Poles stormed the German positions on Monte Casino and planted their red and white banner on the ruins of the old monastery. When the invasion of France came in June 1944 though, it was to lead to the finest hour of the Polish Armoured Division led by their beloved General Maczek. By August 1944, the British, Canadian and Polish forces were closing in on the German 7th Army and 5th Panzer Army from the north while the Americans were moving up from the south in a huge pincer movement. The plan was to trap and destroy the entire German Army in Normandy. As the trap closed, it was the job of the Polish Armoured Division to be the ‘cork in the bottle’ and halt the German escape. They captured the vital high ground known as ‘Hill 262’ and then fought off a series of sustained and increasingly desperate attacks by Werhmacht and SS units who knew the trap was closing. The Poles suffered many casualties but inflicted many more on the attacking Germans and didn’t yield. This contributed hugely to the allied victory in France. After the battles for France, the Polish Armoured Division fought its way through Holland, liberating the city of Breda to scenes of great joy and eventually captured the German port of Willhelmshaven as the war came to an end. For many Polish soldiers though their victories were bitter-sweet. The allies allowed Stalin free reign to dominate post-war Poland and the majority of Polish soldiers would never see their homeland again. Indeed the communist puppet government the USSR set up in Poland stripped many Poles fighting in the west of their citizenship. They gave so much defending their own land and liberating others and their reward was betrayal. Thousands of Poles who returned to Scotland after the war settled there permanently and after leaving the forces had to find jobs in mines and factories. Many married Scottish women and never saw Poland again. General Maczek ended up working in the bar of an Edinburgh hotel where former comrades would buy a drink and salute their former Commander before downing it. The Poles in Scotland were generally made welcome as brothers in arms fighting a common enemy. They were grateful for the welcome they received and have left their mark in Scotland. In the Barony Castle Hotel in Eddleston, (Scottish Borders) which was a Polish Officer training HQ in the war years. 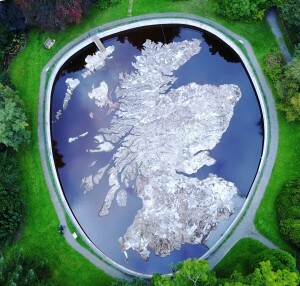 the Polish owner created a huge concrete map of Scotland in the grounds of the hotel in recognition of the welcome the Poles received in Scotland. 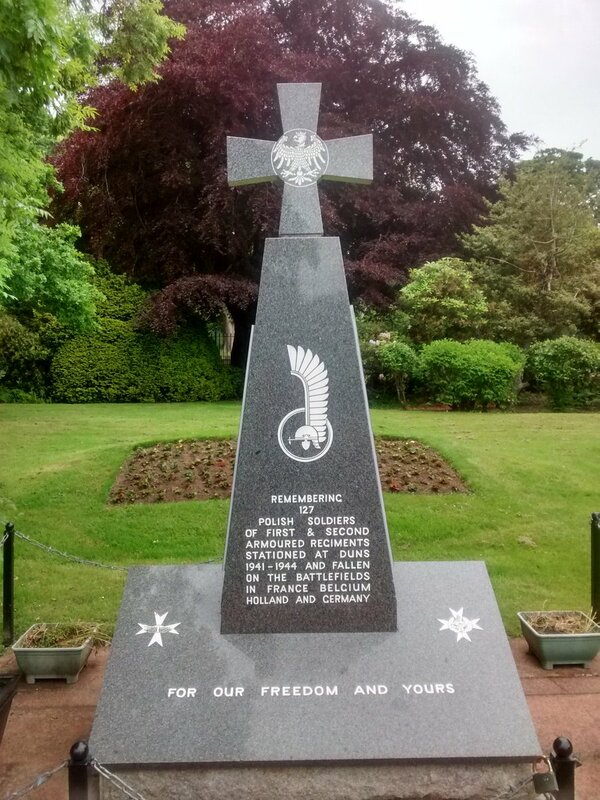 In a quiet corner of Duns, a town in Berwickshire there is a memorial to the Polish Armoured Division which was unveiled by its former Commander, General Maczec. The old General lived to be 102 years old and when he passed on in 1994 he was buried beside his fallen comrades in the Polish military cemetery in the Dutch town of Breda which he and his men had liberated 50 years before. 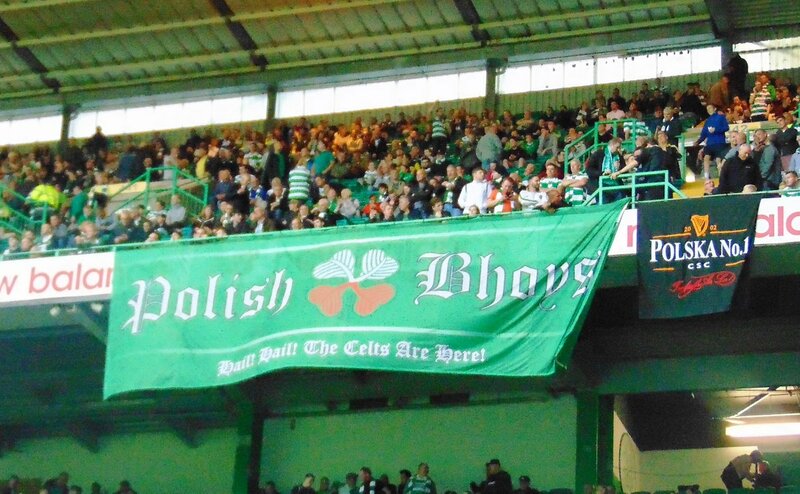 So when you see the flag of the Polska Number 1 CSC or the Polish Bhoys CSC at Celtic Park, it’s worth remembering the contribution the Polish community made to this country. 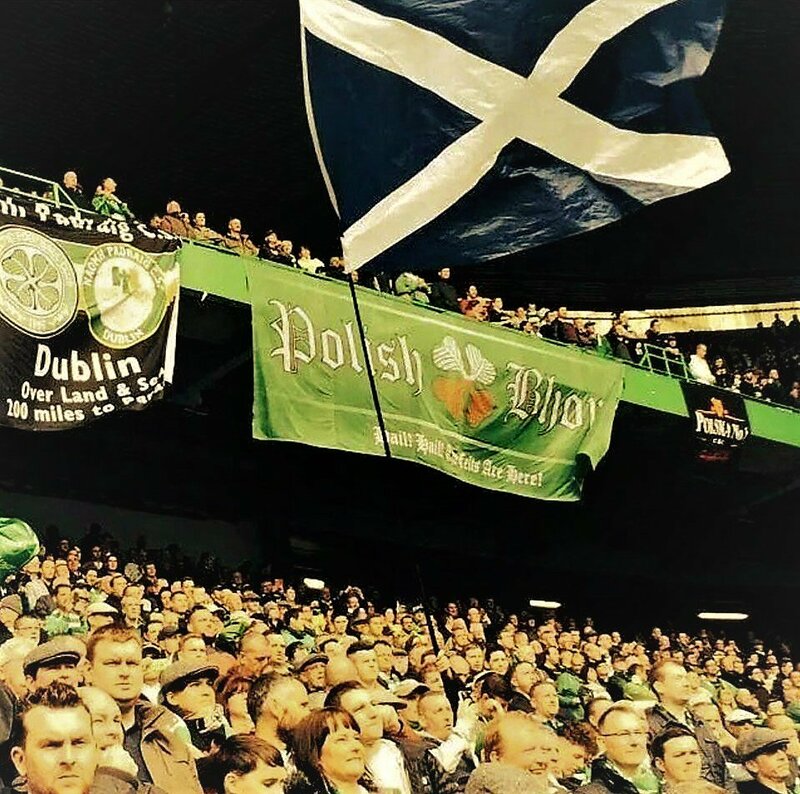 They join many other groups in Scotland who see Celtic as their team and we’re proud to call them fellow Celts. great piece... just need to put you right on one thing. "Russia did not" invade Poland after germany.. Russia invaded poland at the same time as germany !! to the minute !! !check it out ! its there to be found outside the "propaganda" pish ! then think about the implications !! Brilliant piece of writing. I have met Lebanese Celtic supporters proudly wearing the Green and White Hoops in the Malls and Streets of Beirut. These Bhoysand Ghirls were just as passionate about the Celtic as I am. The USSR invaded Easterm Poland on September 17th 1939, 16 days after the Germans invaded in the west (north & south) If I'm wrong then every reputable historian I've ever read is part of this propaganda? The Polish Government give the 17th as the date too. Great article thanks. Just to clarify about the two invasions: Germany and the USSR agreed in August 1939 to divide Poland (and other neighbouring states). Germany invaded on 1 September, but Stalin chose to wait till 17th, presumably to allow the Germans to take the bulk of the flak and thus make it an easier task for the Soviet troops. As an aside my dad was one of those Poles deported to slave labour in Northern Russia who fought in the Polish army then navy before settling in Scotland. He became Chairman of Hamilton Accies in 1969, made Ronnie Simpson manager of the club in 1970/1, then later did the same for Bertie Auld. My grandfather was one of many who managed to escape the atrocities in Poland and eventually settle in Scotland. He saldy passed 27 years ago when I was in my teens, but I have always remembered Poland's sacrifice through adversity, and the new lives many had to build over here from WW2. He was a master builder around Argyll for many years, and I still remember his Celtic mug sitting in the kitchen shelf. He would be proud of the reputation charity and success the club has built up, as I am myself. His experiences,his life story and his legacy to us are in stark contrast to other more locally minded xenophobic opinions from around the country. The conclusion of the Nazi regime had us all told "lest we forget" whilst reminding each other of the danger of right wing extremism. It's as important now as it's ever been to illuminate hose past memories of my grandfather and many like him to ensure those horrific times are never imposed on society again. Great read and a wonderful reminder of the diversity of our club. Great piece. Jan Sobieski III, with his Winged Hussars, was a true hero of Europe. And, rather more recently (and prosaically), Artur Boruc performed some heroics for us on the European stage. God bless Poland. HH. Just to add that St Simon's Church in Partick where Mass is still celebrated in Polish served the Poles that were stationed in Yorkhill Barracks after escaping from the Nazis during the war. Each year at Christmas the Polish community helps to decorate the church with a nod to their homeland. There is a large stone outside with an inscription thanking the church for their help through those difficult times and although a small church it has a very long and distinguished history. I was married in St Simon's 32 years ago by a Fr Tierney who was a very funny man as well. I remember he took in a stray cat and called it Billy. We all thought that it was a strange name for a cat until he explained that most Billys in Glasgow had strayed from home lol. If I remember correctly Tosh McKinlay's father was a passkeeper there around that time as well.